Blackjack is undoubtedly one of the most exciting casino games whose rules are moderately simple to grasp. This card game is played by hundreds of players all over the world as it offers them a good dose of adrenaline and a high level of entertainment. It is a skill-based game which gives gamblers the opportunity to master it to a huge extent by applying a strategy and this way, significantly reduce the house edge. The first step towards becoming a proficient player in blackjack is to learn its basic rules and moves. It is essential to be prepared for all of the tricky situations beforehand as this way players will be able to make the best possible move when they occur. The main rules of blackjack are very straightforward and simple which makes it even more enticing. Even though the game is played with several players at once, all of them compete only against the dealer. Each participant has to form a hand whose total value is as close to 21 as possible, without surpassing this number. The game gets its name from its main objective and this is the reason why it is often referred to as twenty one, instead of blackjack. 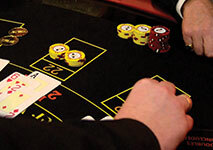 Just like in many other casino games, in blackjack the cards are valued according to a unique card system. It should be noted that the suits in this game are irrelevant since they don’t play a part in the total value of the hand. All of the cards are counted as their pip value, except for the face cards – a King, a Jack or a Queen as they get ten points each. The most desired card in the deck is the Ace due to the fact that its value can be either one or eleven. It gives players the chance to be flexible with their hand and form winning combinations much easier. Once they get an Ace, they can switch its value infinite times according to their needs. A hand that consists of a Ten card and an Ace is considered natural blackjack and a hand that contains an Ace, that can be valued as eleven without surpassing twenty-one, is referred to as a soft hand. In most cases, blackjack pays 3/2 but players should bear in mind that the payout can differ from one casino to another. The winnings are usually paid out when the turn of the respective gambler comes. 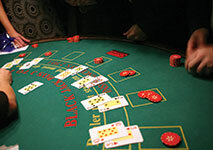 In blackjack, the number of the decks involved depends on the variation of the game as well as the casino. From one to eight standard packs can be used in the game and in most cases, six decks of 52 cards are shuffled together in the shoe. The place from where the cards are dealt is called a shoe and this term is used in other table games as well. The cards are reshuffled when the plastic card, placed by the dealer at the bottom of the deck, is reached. In general, the house edge is higher when the game uses more decks. Years ago, blackjack was played with only a single pack of cards, however nowadays this is not the case. Due to the fact that a number of efficient card counting systems have emerged, the casinos increased the number of the decks in an attempt to prevent card counters from successfully gaining advantage. Once players have received their first two cards, they have the chance to choose whether to hit, stand, double down or split. In order to indicate any of these moves, gamblers have to use an already established by the casinos gesture or clearly state them to the dealer. It should be noted that most casinos have their preferences when it comes to this matter and thus, it is best to get familiar with them in advance. The first move hit is used when gamblers want to take another card in order to form a stronger total in their hand. In face up games, they should tap the table with their fingers in order to make this move. The opposite move of hitting is standing and in such cases, players are not dealt any cards. In order to indicate it, they should move their hand above the cards horizontally. The next available move that can be made is doubling down and it is used when players want to make their initial bet twice as much. In order to do so, they have to put an amount that is equal to their original wager and after that, they are dealt one more card. To indicate it, players have to place their extra bet next to their initial wager and simply point at it. One of the card combinations that players are bound to get at some point during the game is a pair of two cards of the same rank. In such cases, it is possible to split them and this way, form two new hands that are completely independent. If players want to make this move, they are required to put the same amount as their initial bet and spread their fingers as if they wanted to show the letter V. If players get another pair, it is also possible to resplit it, however some casinos have certain restrictions on the number of times that they are allowed to do so. Besides these main options, players also have the chance to take advantage of two additional moves – ‘surrender’ and ‘take insurance’. Whether these moves are allowed or not, depends on the casino and the variation of the game. When available, players can surrender by giving up their current hand, without playing it and in return, they get to keep half of their bet. The rest of their wager goes to the casino. Since there is no established signal for this move, it is made verbally. Players have the chance to take insurance or in other words, place a side bet that will make up for their loss if the worst case scenario occurs and the dealer has blackjack. It can be made only if the up card of the dealer is an Ace and it usually pays 2/1. In order to make this move, players are required to place half of the amount of their original wager. It is best to take advantage of this side bet if there is a high chance for the hole card to be a ten-valued one. Once players have placed their bet, the game begins and the dealer deals each player two cards, face up on the table. In some blackjack variations these cards are dealt face down which is the reason why it is best to double check the rules of the game beforehand. After that, the dealer deals two cards to himself – one face up and one face down which is called the Hole card. On the next stage players should make up their mind and choose one of the above-mentioned moves. Their final decision should be based on the total value of their hand and the up card of the dealer. In order to manage to make the best possible move, players should follow a basic strategy and stick to it throughout the play. Also, they should bear in mind that if they exceed twenty one, the result is busting or an instant loss of their bets. After the dealing of the cards is done, the dealer’s face down card is revealed. In most games, he is enforced by the rules to stand if his total is at least 17. If the dealer’s total is no more than 16, he must draw a card and continue to do so until he reaches 17. In contrast to the players’ choices, the moves the dealer must make are predetermined in advanced and therefore, his play is automatically conducted. In blackjack, the dealing of the cards and their position can differ from one casino to another. 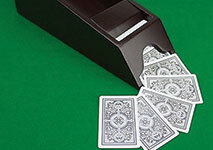 For instance, games that contain a face down card are called Hole card games and in them the dealer peeks for blackjack. These games are considered more advantageous for players as in them, they are prevented from placing a large bet when the dealer is bound to win. It is also possible to play no Hole card games in which the dealer doesn’t peek for blackjack. Players also have the chance to try the so-called hand-held games in which their first two cards are dealt face down. In contrast to hand-held games, in shoe games the first two cards of the players are dealt face up. Blackjack is a card game whose basic rules are fairly easy to learn. In order to be able to play the game properly, novice players should learn the assigned value of the cards, the possible moves they can make and how the gaming process is conducted. When it comes to blackjack, knowing the rules is not enough to win as the game also requires skills and a strategy. However, every expert was once a beginner and learning the basics of the game is surely a decent start.